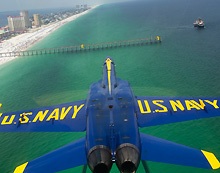 NAS Pensacola is located in the panhandle of Northwest Florida. The installation covers a total of 8,423 acres of land - 5,804 acres at NAS Pensacola proper, and over 2,500 acres at other locations. NAS Pensacola was the first Naval Air Station commissioned by the U.S. Navy in 1914. Tens of thousands Naval Aviators have received their training there including John H. Glenn, USMC who became the first American to orbit the earth in 1962 and Neil Armstrong who became the first man to set foot on the moon in 1969.